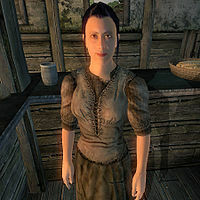 Luciana Galena is a very flirtatious Breton Thieves Guild fence in Bravil. If you have bought the House For Sale in Bravil, she will be your neighbor living above you. She is also an advanced trainer in Light Armor. Because Luciana is a fence, her barter services are only available after you have joined the guild and been promoted to the rank of Cat Burglar (by completing the quest Misdirection). In Bravil, word on the street has it that Luciana is quite antisocial and barricades herself in her house all day long. The townsfolk are obviously wrong as Luciana spends a considerable amount of time away from home and even helps out at the Lonely Suitor Lodge. She wakes up every day at 8am and spends her morning strolling around inside her house. At midday she leaves and enters the lodge for a two-hour lunch. At 2pm she positions herself behind the bar where she will stay for a whopping twelve hours, helping out innkeeper Bogrum Gro-Galash and socializing with the regulars. She heads back to her house and finds her bed at 2am. Both training and bartering services are available 24 hours a day, but Luciana will take precautions and deny you any illegal activities while she is outside. Luciana wears a set of lower class clothing consisting of a coarse linen shirt, coarse linens, and a pair of clogs. She is armed with a fine steel war axe and carries her key and a small amount of gold. Galena has a very flirtatious nature. The first time you meet her she will announce "Hello, stranger. Luciana Galena. I'm Bravil's Advanced Trainer for the Light Armor discipline." but after that she asks "Is this pleasure or business?" instead. The flirting is most obvious when trading. Her responses include "You are one hot customer! ", "So what's hot today? ", "See anything else you're interested in? ", "I do think I'm being taken advantage of." and "Let's just keep this affair between the two of us." When asked about Bravil, she will tell you about her fellow trainers: "Other Bravil trainers? City-Swimmer teaches Sneak. Dro'shanji teaches Security. Varon Vamori teaches Speechcraft." As an advanced trainer in Light Armor, Luciana is one of two people who can point you in the direction of master trainer J'bari for further training. Once your Light Armor skill reaches 70, speak to her about training and she will say: "Head to Leyawiin, and find J'bari. He's the one you want to talk to about Light Armor training." Around town, people comment on how much time she spends in her home, which is odd considering how often she is to be found at the Lonely Suitor Lodge. They will say "Have you ever met Luciana Galena? ", "Is something wrong with Luciana Galena? She rarely leaves home." and "She tends to keep to herself, that's for sure. That's too bad." Others will mention her training skills: "She doesn't leave home much, but apparently Luciana Galena has a lot of experience fighting in light armor. and "I hear she's a very private person. I also heard she knows a lot about using light armor." The other rumors about her come from the Thieves Guild doyens, S'Krivva and Armand Christophe, who will tell you that "Luciana lives in Bravil. She is a decent fence. Better than Ongar and Dar Jee at least." Esta página foi modificada pela última vez à(s) 05h34min de 20 de outubro de 2015.